Formlabs has bragging rights as the most funded Kickstarter technology project of all time. The MIT Media Lab-backed effort developed an affordable 3D printer that was wildly successful on the crowdfunding platform and raised just $56,000 shy of breaking $3 million. But Formlab was hit with a patent infringement suit last week by 3D Systems for the style of 3D printing that the company claims is being infringed on, called stereolithography. But embroiled in the lawsuit is Kickstarter, which 3D Systems claims was facilitating the sale of Formlab’s project and is placing equal blame. From the looks of it, 3D Systems might have a case since the company does own Patent No. 5,597,520 for the stereolithography process called “Simultaneous multilayer curing in stereolythography.” And even the Formlabs Lead Engineer acknowledged stereolithography patents were on the verge of expiring, so the company claims that Formlab must have known that it would be infringing on a patent. “3D Systems invented and pioneered the 3D printing technology of stereolithography and has many active patents covering various aspects of the stereolithography process. Although Formlabs has publicly stated that certain patents have expired, 3D Systems believes the Form 1 3D printer infringes at least one of our patents, and we intend to enforce our patent rights,” said Andrew Johnson, General Counsel of 3D Systems in a statement attached to its press release. From what we can decipher from the lawsuit, 3D Systems cites 35 USC § 284, which means that 3D Systems is looking to receive a royalty from the “damages” that occur with the sales of Formlab’s printer, together with the interest and court fees. Despite all this though, Kickstarter has been named as a party that has infringed on patent in question simply through association and for permitting the sales of the Formlab printer. It’s a mite suspicious that 3D Systems would come out with a patent suit against both Kickstarter and Formlabs after the project’s funding period ended last month. Could its motivation have something to do with cashing in on the success of Formlabs’ 3D printer from a PR and financial perspective? After all, now 3D Systems is really now in the public’s eye, and 3C Systems may just be seeking royalties from Formlab’s sales. Worth noting is that the company is selling its own personal 3D printer called “Cube” for almost $2,000 less than what Formlab’s Form 1 printer costs. The outcome of the lawsuit could change how future Kickstarter projects are vetted. If the company is found guilty, the future of how projects are let into the site could drastically change. As for Formlabs, the outlook is rather bleak, so your orders could be delayed. 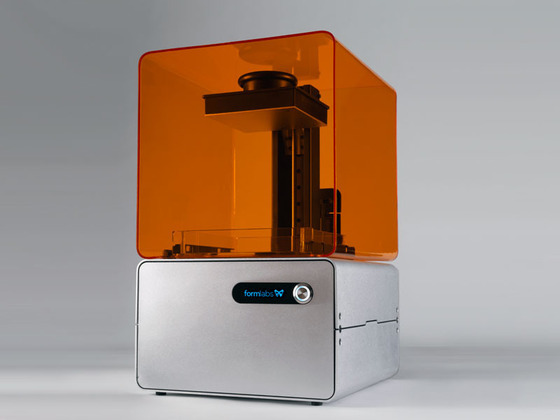 We reached out to Formlabs, and 3D Systems and we’ll update you with their response.